While eagerly waiting for Ava, Mc and I strolled around and decided to eat some snacks at Auntie Anne's. After which, we decided to go window shopping (at least that was the intention!) After a few meters of walk, we found ourselves talking to an Israeli named Liraz introducing their beauty products all manufactured from Israel proudly telling us their products came from the Dead Sea, yup the famous sea where people can actually float due to its high density of salt. I have been dreaming of one day floating on it ever since I was a kid. Interested, I started questioning about those Dead Sea products. Liraz was kind enough to share stories about her country and how locals and tourists love getting all masked up with Dead Sea's mud. Through her, I discovered a lot about Israel's most famed destination I have only seen on National Geographic! Going back to the products, you bet they're pricey! But since I was in a really good mood at that time, and Liraz did such a great job demonstrating the benefits, we finally said yes and bought 2 of their Jericho products. I felt ridiculously happy, like I finally own and experience a part of the Dead Sea, and then it dawned on me, I have to tighten my belt again this Christmas (scratching the head). Now hungry for dinner and sensing that Ava will be coming a little longer (traffic in the Metro this season can get crazy! ), we scouted for restaurants we haven't eaten before. 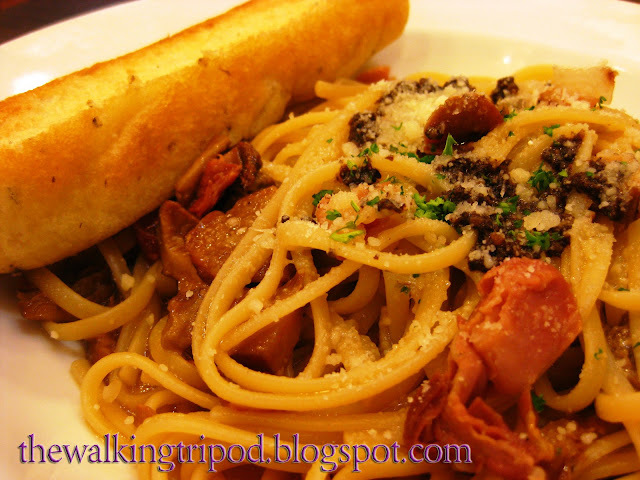 We're craving for pasta and pizza (calories! ), and so we finally settled down at Amici. Check out more of Amici at my food blog - Cook this Recipe. One thing we realized was that this food establishment shares a fraction of their income to Tuloy Foundation. 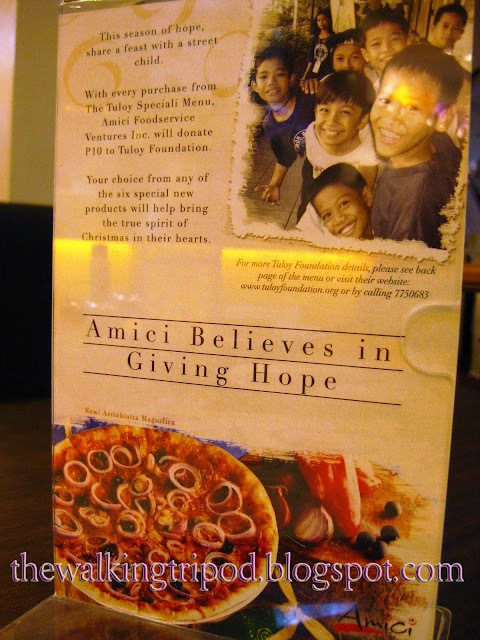 Every purchase from the Tuloy Speciali Menu, Amici will donate P10 to Tuloy Foundation to give a street child his dignity and give him hope towards a brighter future. A great way to share our blessings this Christmas while enjoying good Italian food. 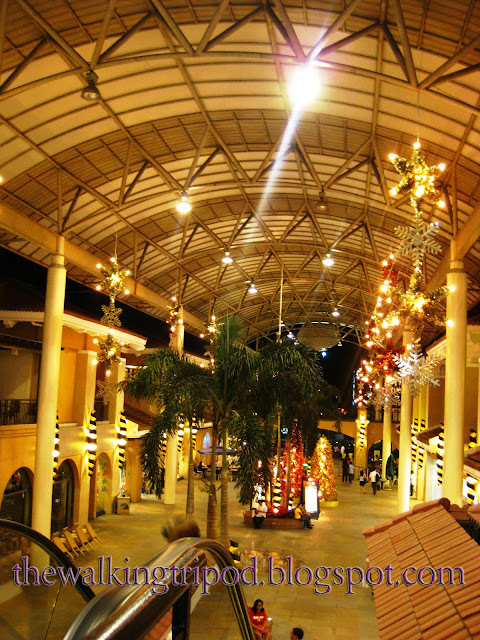 With Alabang Town Center all glamed up, the three of us shared the rest of the night with endless talks, loud laughs and with high hopes on our future plans (on business, travel and relationship). 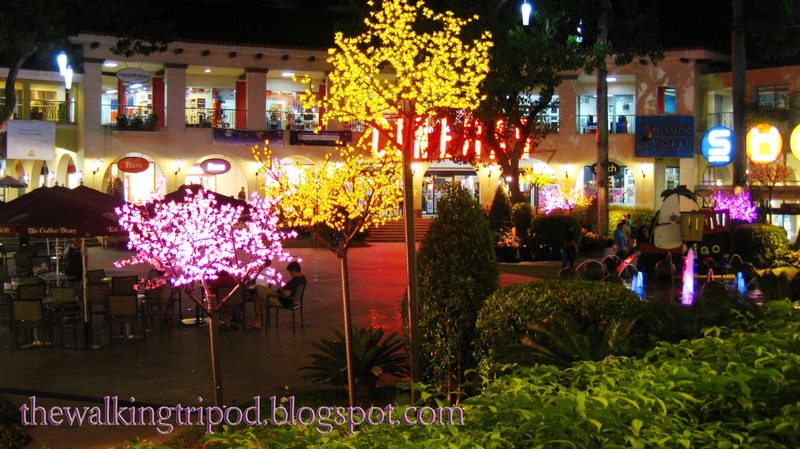 You can view more pictures of Amici and Alabang Town Center at The Walking Tripod. Hi. I am a graduating student from UP Manila and I saw your post over at PinoyExchange on the thread on blogs. I was wondering if you could answer a survey I made regarding Filipino bloggers. This is for my thesis and answering will only take you a couple of minutes.